Today, in this article we are going to talk about Some interesting facts about Sahoo Pokhar Muzaffarpur. It is one of the oldest pond in the city. It has a very beautiful history. At present, it is not as glorious as its past. The pond is now a days very Filthy. The pond is getting polluted everyday by the garbage and sewage. Moreover, it is a heritage of the city. We should protect it. Also Read: Muzaffarpur Electricity Bill: How to Fetch it Online? The Historic Sahoo Pokhar is about 250 years old. It is situated at a few meters distance from the famous Gareeb Nath Mandir, Muzaffarpur. People of the City treat it as Mansarovar. It was made by Shiv Sahay Prasad Sahoo in 1754. Once a very great writer Dr. Spooner Came for a visit in 1917. He was so impressed with scenario that he mentioned this pond in his book too. Further, the stones that were used in formation of this pond were imported. The stones were imported at Malighat shore through river route. It was scattered across 6250 meter square. To ensure the inflow of water in the pond. A drainage from Akharaghat to the pond was made to ensure the flow of water from Boodhi Gandak river to the pond. To ovoid overflow, there was a drain from the pond to Chandwara. So, that the excess water flow back to the river. Undeniably, the history of this historical pond is magnificent. It had it’s own identity in the city. Today, the situations are different. The pond is very filthy and unhygienic. The pond needs a proper clean up. We should protect it from further pollution. We should definitely come forward to protect our heritage. 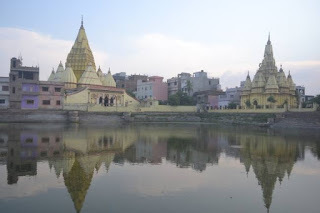 Today, in this article we are going to talk about Some interesting facts about Sahoo Pokhar Muzaffarpur.